This week’s visit to Cornwall by the Secretary of State for Transport, Chris Grayling, got me thinking about the times I have managed communications for visits by politicians and members of the Royal family. Handling communications for VIP visits is a particular skill. You need the patience of a saint when liaising with press teams from the various Government departments (especially Number 10) and the different Royal Households; the diplomacy of a member of the United Nations when managing the egos of the people who want to meet the VIP (usually over where they are placed in the line up); and then the skin of a rhinoceros when dealing with the media on the day. My first experience of a Royal visit was from the other side. As a young trainee journalist I was sent to play with the proper press when Princess Diana came to visit St Austell. I was thrilled to be given the opportunity, until I realised I was only there to give a “women’s opinion” on the style and colour of her dress – a fact clearly pointed out to me by the more experienced members of the press pack. It was still a memorable experience watching the cheering crowds react to her arrival. I did get to write a story in the end, making it the first time I used the royal visit cliché “the sun came out to welcome …” much used and much loved by journalists. (If it rains you can use the other royal cliché: “the rain failed to dampen the enthusiasm of crowds at …”). 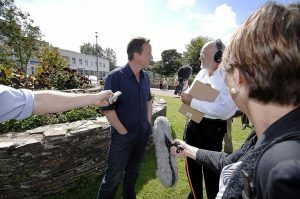 Since then I have managed communications for many Royal visitors to Cornwall, from visits to the Royal Cornwall show by the Queen, Prince Charles and other members of the Royal family, to the opening of a primary school by the Duchess of Wessex where she got to play with a fluffy yellow duckling. Royal visits usually go very well. There is always a recce beforehand with a member of the royal household and the police, which irons out any potential pitfalls and agrees who goes where and when. Most people are very well behaved (including the grown ups), and members of the public turn out in force smiling and waving flags. Even the media usually do as they are told (albeit with grumbles if they’re not allowed to stand in a particular place to get that special shot). Sometimes, however, there can be hiccups. On one occasion, a police sniffer dog got too excited when checking out a building where the Duchess of Cornwall was due to meet some young mums, and collided with a baby in a pushchair (luckily neither the baby or the dog were injured). On another occasion, a member of Prince Charles’s retinue told me during a recce for a visit to a primary school that the media would have to be in a classroom when HRH arrived and then stay there until he left. I pointed out this meant they could not then cover his visit to the next classroom, only to be greeted with a shrug and a “that’s your problem” response. Luckily some of the classrooms had doors out to the playground as well as a main entrance door, so I took the media out that way as soon as he had left one classroom room and we then rushed into the next before he arrived. Slightly hectic, but it worked. 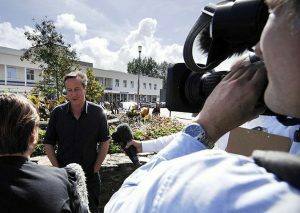 And then there was the more personal sartorial crisis during a visit to Trewithen by the Duke and Duchess of Cornwall. It had been raining heavily, meaning that the ground being used for the garden party was very muddy and we were advised to wear wellington boots. As someone who is famed for her Imelda Marcos-like collection of heels, this was shocking news, but luckily I managed to resolve the situation by wearing a pair of bright pink boots. As someone who is not a fervent royalist, I am always slightly cynical about the ‘royal effect’ on the public, but it is certainly true that visits by members of the Royal family during a crisis do seem to cheer most people up. During the 2011 floods in Mid Cornwall, which devastated large numbers of homes and businesses, people in Lostwithiel stopped clearing up their properties to speak to Prince Charles. Afterwards, they told reporters his visit had been a bright moment in an otherwise awful experience. However visits by members of the Royal family (or national politicians) during a crisis are not always seen as a good thing by those trying to deal with the situation, as it means they have to stop what they are doing to organise the visit. Having been dispatched to deal with the media on such occasions, usually at very short notice and, on one memorable occasion, having to leave the emergency centre to manage a visit, I have seen the impact from both sides. Usually it does help those affected by the crisis to see that someone cares enough to come and talk to them, and a failure to do so can lead to criticism (witness Theresa May’s actions following the Grenfell Tower fire), but it can be hard work for those managing the crisis. Before I reminiscence about visits by leading politicians, let me deal with some royal visit myths. It is often said that the owners of buildings due to be visited by a member of the Royal family spend huge amounts of money sprucing them up beforehand. While this may be true, the most I have seen personally is the decoration of a toilet which had been designated for royal use during a visit to a school, and some frenzied grass cutting and weeding. Visits by national politicians are actually very similar to royal visits. Lots of toing and froing beforehand between the Government department and the organisations involved to draw up the itinerary for the visit, decide on who should meet the guest, where the inevitable photo opportunities should be, and what food and drink to provide. The last two are also key issues in a royal visit: you would not believe the intense discussions about menus and who should be photographed with the Royal guest, and that is without even starting on finding a suitable gift. If the visit involves an opening ceremony or the unveiling of a plaque, there is also the panic over finding the right pair of scissors for cutting the ribbon, checking the spelling of names and, finally, making sure that the curtain opens properly. Cornwall has seen more than its fair share of national politicians, particularly during elections. From visits by numerous Transport Ministers to open new roads, announce new flights or train services, to the much-photographed event of the Prime Minister signing the Devolution Deal and Jeremy Corbyn’s rally at Heartlands, Cornwall appears to be a popular destination with both Government and Opposition Ministers. One issue you need to consider when organising a visit by Ministers, however, is that they may not still be the Minister when the date arrives – always a slightly awkward situation to manage. And then there are the occasions when you have spent lots of time schmoozing the Minister so they understand Cornwall’s needs, only to discover that they’ve been sacked when they get back to London and all your hard work has been in vain and you have to start again with the new person.